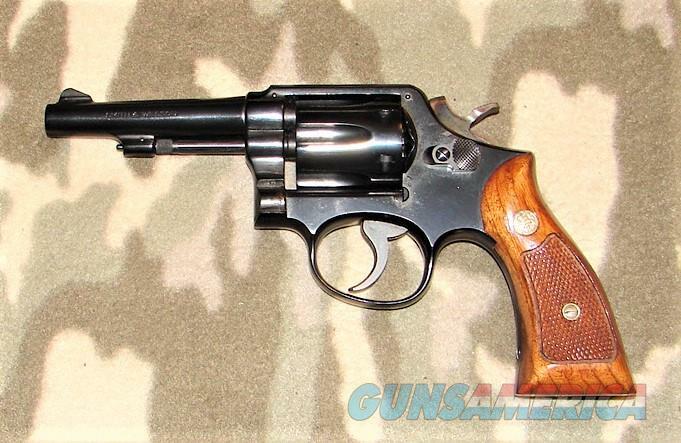 Description: Rare Smith & Wesson Model 45-2 Military & Police Revolver serial #C883299, 22 LR, 4" pinned barrel with an excellent bore. This model is also referred to as the "Post Office" model after they designated the 22 M&P as an official training gun for their agents. It was continued as the model 45 and later the model 45-2 and w as sold to various agencies as training guns. This lovely specimen is a rare three screw Model 45-2 with no model number stamped on the frame. In 1978, at the end of production, 135 guns were assembled that omitted the model number stamp on the frame and fell into the C883xxx serial number range (Standard Catalogue of Smith & Wesson by Supica and Nahas). This revolver retains about 98% blue with a light turn ring on the cylinder, a small patch of rough finish on the bottom of the bbl near the muzzle and few minor handling marks. The standard hammer and standard trigger retain robust case-hardened colors. The checkered walnut factory Magna grips with silver S&W medallions rate excellent and are correctly numbered to the gun. This gun has seen little if any use and retains wonderful condition. A very rare must-have for the dedicated Smith & Wesson collector.